Long before Modern Family was on TV, Falsettos was on stage. The musical by William Finn and James Lapine, which hit Broadway in 1992, plunged headlong into the gnarled tangle of traditional ideas and contemporary realities of what constitutes a family. Consider its protagonist and patriarch, Marvin. Far from being the sage, emotionally reserved father figure of yesteryear, Marvin is high-strung and deeply conflicted. And, as it happens, gay. When Falsettos opens with the number "Four Jews in a Room Bitching," Marvin is trying to reconcile his relationship with Whizzer, his libertine new boyfriend, with the relationship he wants to continue having with his ex-wife and son. Is it so unreasonable, he asks through the song "Tight-Knit Family," to "want it all," to have "kid, wife and lover" live harmoniously in this kind of unconventional arrangement? Though set more than decade earlier than it was written, Falsettos remains topical and resonant enough to have warranted a highly acclaimed Broadway revival during the 2016-17 season. Nearly a year to the day after that revival wrapped up its run, Lake City Playhouse is staging Falsettos with a local cast that includes Brandon Michael (recently seen in Coeur d'Alene Summer Theatre's South Pacific) as Marvin, Alyssa Hersey as his ex-wife Trina, Aidan Headley as his son Jason, and Duncan Menzies (the Civic's West Side Story) as Whizzer. Kasey Davis, who previously appeared in The Music Man and both directed and choreographed Shrek: The Musical at CdA Summer Theatre, is heading this production. "It's fairly timeless, even though it sits within a very specific time and place," she says. "There's an element of strong women and feminism in this play that is very relevant right now with the #MeToo hashtag and women speaking up for themselves." 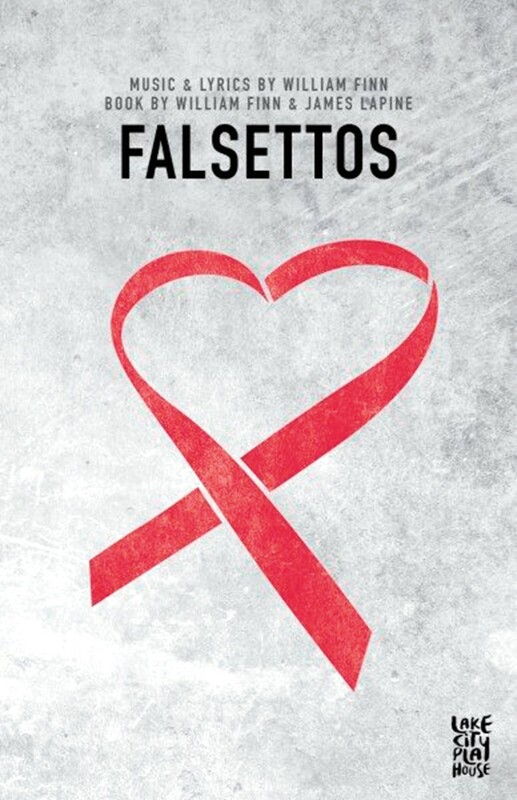 Much like Rent, another enduring musical that emerged during the same time period, Falsettos also deals with AIDS and the disease's profound personal impact. "It is about sickness," Davis says of Falsettos, "but it's much more about actual relationships. Anything that's written well is about the thing it's about, of course, but it's more about the people and the relationships that they have. And this show is nothing if not about relationships. There's a piece of each character that you can identify with no matter who you are." This marks Davis' first time directing in this venue. Owing to the novelty of the space as well her past experience with Falsettos, she readily agreed when Lake City Playhouse approached her with the offer. "I also love working with small casts. Having been a musical theater person for a long time, I feel like I'm often involved in very large productions, so I loved the idea of a seven-person cast. As an actor and as a director, it's so fun to have the time and the ability to be more intimate with a small cast. You can really dive into the material." The limited number of available roles and the musical's popularity meant that competition was tight. Davis says that made the audition process tougher than usual. "Talent-wise, it was tricky. We had a couple of women who were super talented, and it was a hard decision, which was a wonderful problem to have. Part of it also came down to those relationships and piecing together who we thought seemed like they would work well together as couples." Given the swift, episodic nature of Falsettos, which began life as two one-act plays written nine years apart, establishing credible onstage chemistry quickly is key. It will be doubly important on the modestly sized Lake City stage, where the performers will also be joined by music director Jenny Twitchell on keyboards. "Musically, it's a huge, huge show. The amount of counterpoint and the way the actors interact through song — it's quick and it's witty," she says. "Another challenge is that the show just doesn't stop moving. How can you make that work in a space with no wings and no fly?" Yet Davis aims to turn all of that to her advantage, as did previous small-scale productions of Rent and Les Misérables here. The original print version of this article was headlined "Modern Family"